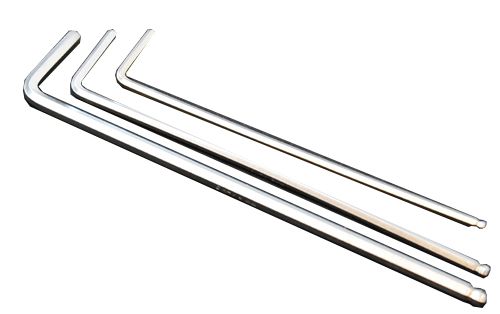 I´m very pleased with this Hex Key Set. Excellent quality, good finish, reliable and precise. The only suggestion I´ld make is that an additional Hex Key could be provided where the short side of it could be even shorter (cut). This way, I could used it to access the Race Master Hanger Angle Screw out in the range without having to remove the alluminum body and the firearm from the holster. I had to manufacture (cut one regular sized hex wrench) one my self and incorporate it to my Hex Set. Nevertheless, I´m very pleased with this product, no questions about it! This is a metric 3 piece long hex key set, which will cover your needs for DAA Holsters and Pouches. The Alpha-X and Race Master holsters include this set as standard, however keys are not included with our Kydex holsters. If you do not have a set of metric hex keys at your disposal, you should consider adding this set to your DAA Kydex holster order.